Powermatics is one of the market leader in the hydraulics industry with a wide customer base spanning across Southeast Asia. Founded since 1977, we have been engineering total solutions for a diverse range of industries. 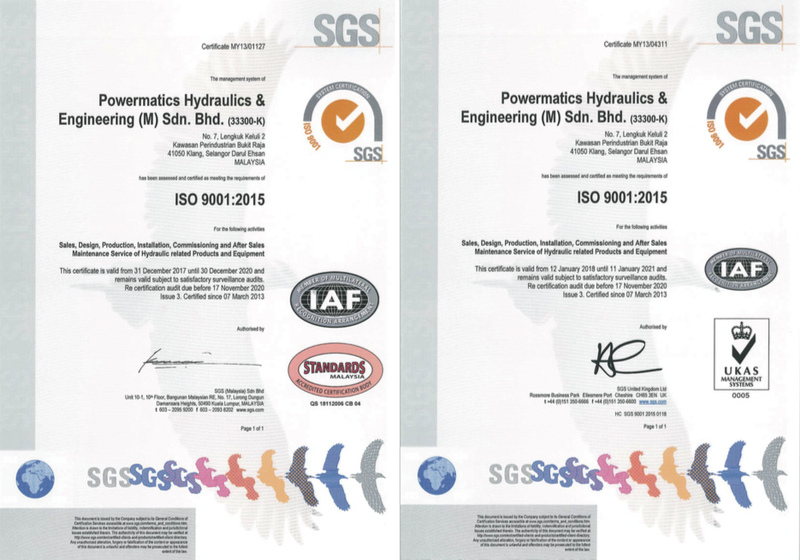 We are renowned for High Quality Products, Services and Safety with global certification and standards certified by ISO 9001:2015. Integrity is our first core value because it sets the standard for everything we do—our company policy is zero tolerance for unethical behavior. We strive to be honest, ethical, and fair in everything we do. We lead by example and concentrate on doing the right thing every time. We accept responsibility and hold ourselves and each other accountable. Exceptional Quality POWERMATICS’s goal is exceptional quality—every time. We focus on continuous improvement, while we foster technical excellence and innovative solutions. This principle is well-reflected in our high client satisfaction ratings and key industry recognition. We are deeply committed to meeting the needs of our customers with superior products, customer service and industry knowledge. We work with a sense of urgency in delivering a seamless solution. We work together to achieve team glory. We think “win-win” always for our clients, partners and colleagues. We work together to bring out the best from our combined talents, experiences, knowledge and cultures, thereby creating strong and successful relationships. We are personally accountable for our own safety and collectively responsible for each other's safety. In meeting our goals for quality, cost and schedule, we do not compromise on maintaining the safety of our workplaces, products and services. To be the leader in hydraulics engineering and solution provider, always fulfill and strive to exceed our customer and stakeholder requirements.